Diwali is not only a festival of lights and celebrations. 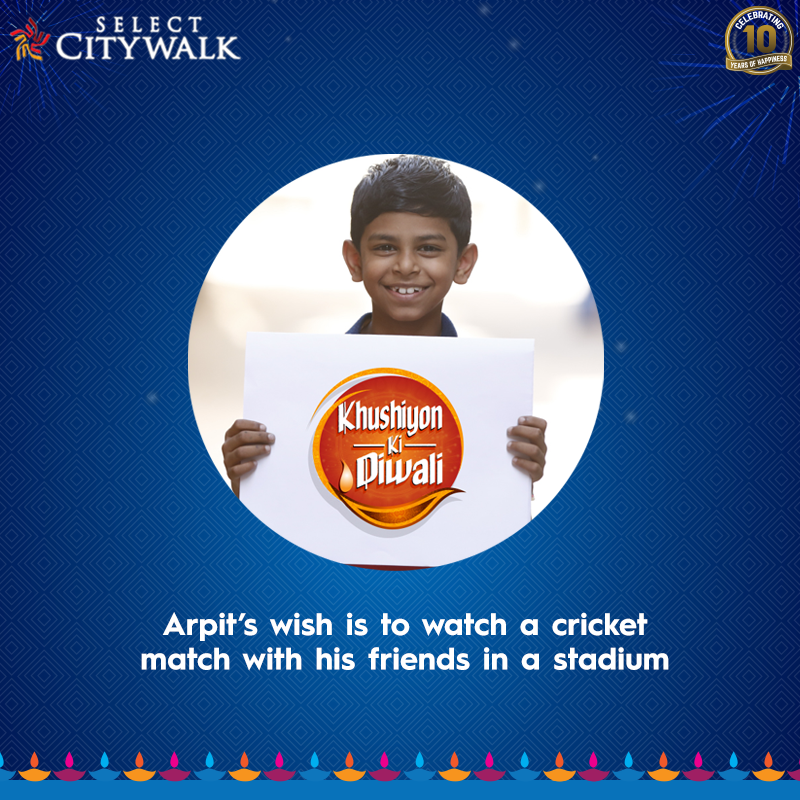 It brings with it the spirit of giving and sharing, and Select CITYWALK believes that it is an occasion to give back to the society. 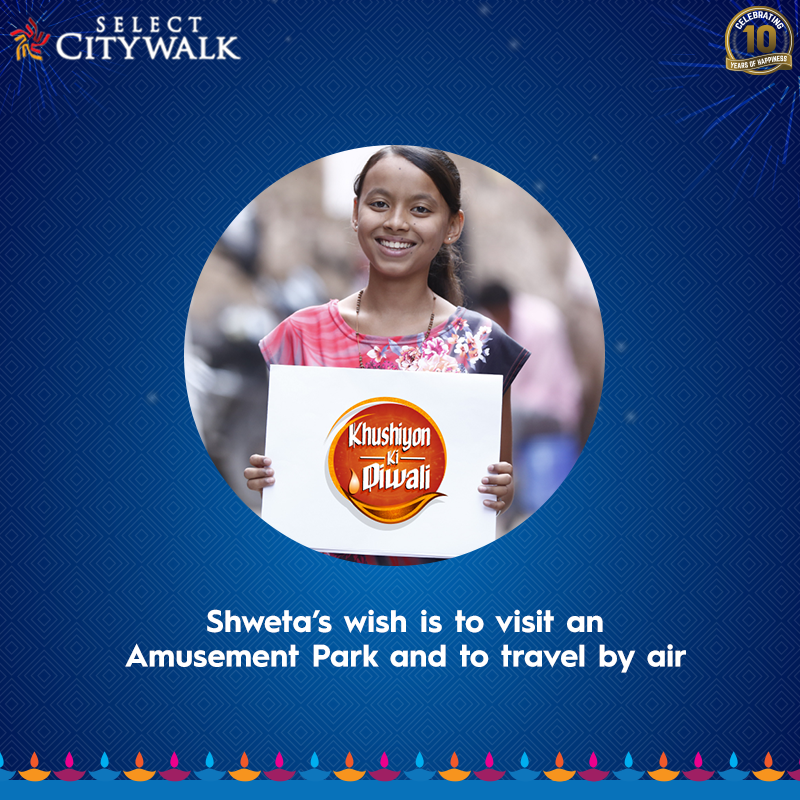 As CITYWALK completes a successful decade, we wish to celebrate the milestone with underprivileged children by gifting them the small joys of life. For the past ten years it has been our endeavour to bring happiness in the lives of our customers and partners and it only made sense that we fulfill the desires and wishes of ten children as a start to our glorious ten year anniversary celebrations. We decided to do things a little differently this Diwali. 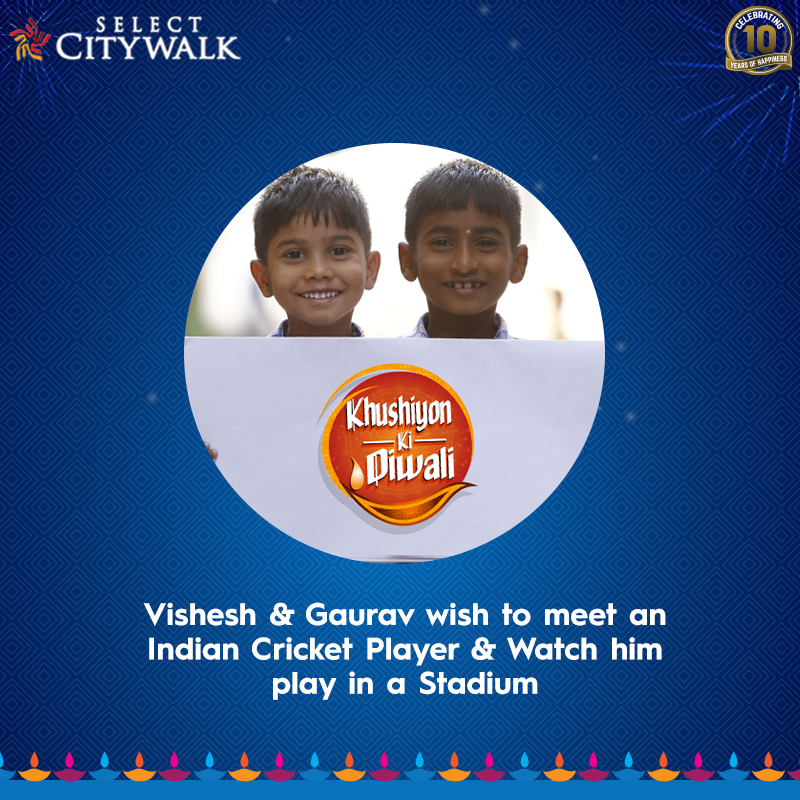 We launched a Corporate Social Responsibility campaign called “KHUSHIYON KI DIWALI”,where we selected 10 underprivileged children and asked them to make a wish. With the help and support of our valued customers, we raised enough funds to make their dreams come true. An activity was conducted from 7th to 15th October in which the effort was to collect enough funds to fulfill one dream each day. We would like to share these heartwarming stories with you. We thank you from the bottom of our hearts for being a part of this wonderful initiative. Like all of us, he dreams about getting his favourite things on Diwali and we wanted to transform his paper planes into a real airplane. 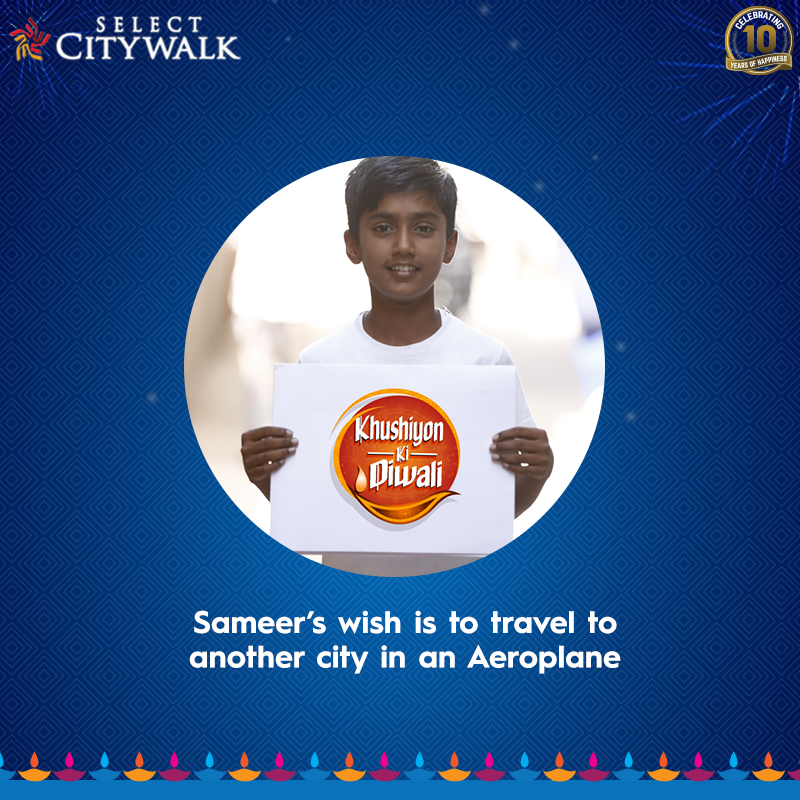 Sameer is a diligent 12-year-old child who loves to write, make paper planes, and play cricket and football with his friends. When he sees an airplane from his house, all he wishes for is to travel on it one day with his family. We raised a grand total of INR 50,130 to turn his dream into reality. 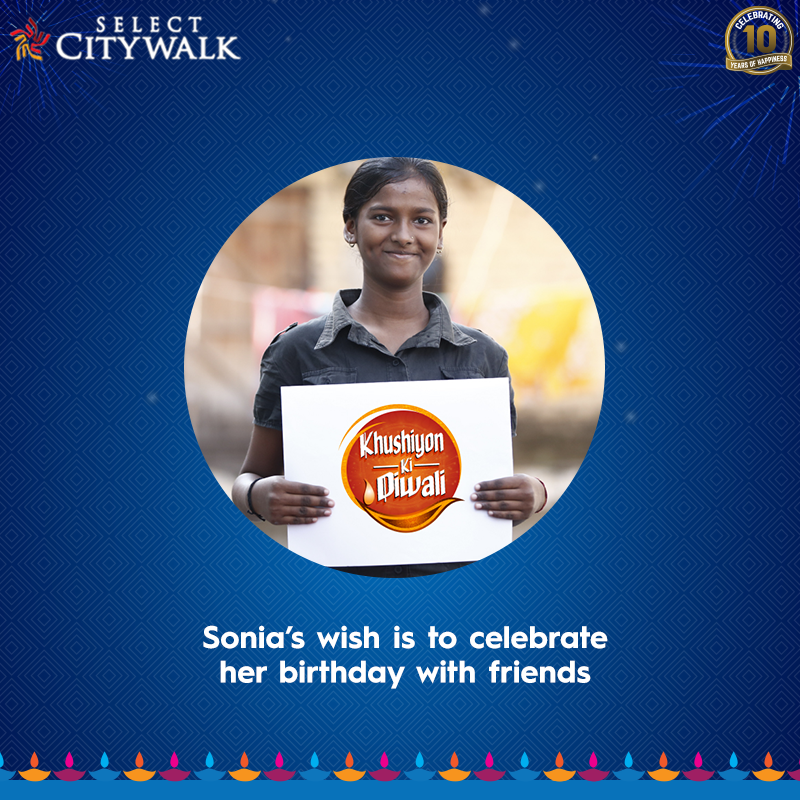 Celebrating birthdays is a luxury that Sonia’s parents cannot afford. Sonia is a happy-go-lucky 14-year-old girl. We raised a combined total of INR 35,090 for Sonia to celebrate a grand birthday with her parents and friends. They want to watch a match from the stands of a stadium and meet their idols. The quirky sons of a tailor, Vishesh and Gaurav have wishes that cannot be fulfilled with what their father earns. We collectively raised INR 51,260 in hope to fulfill their dream of watching a cricket match live and meeting their idols. She believes her life is a concert in which she is the star and wants to live that. Simran’s life revolves around music. 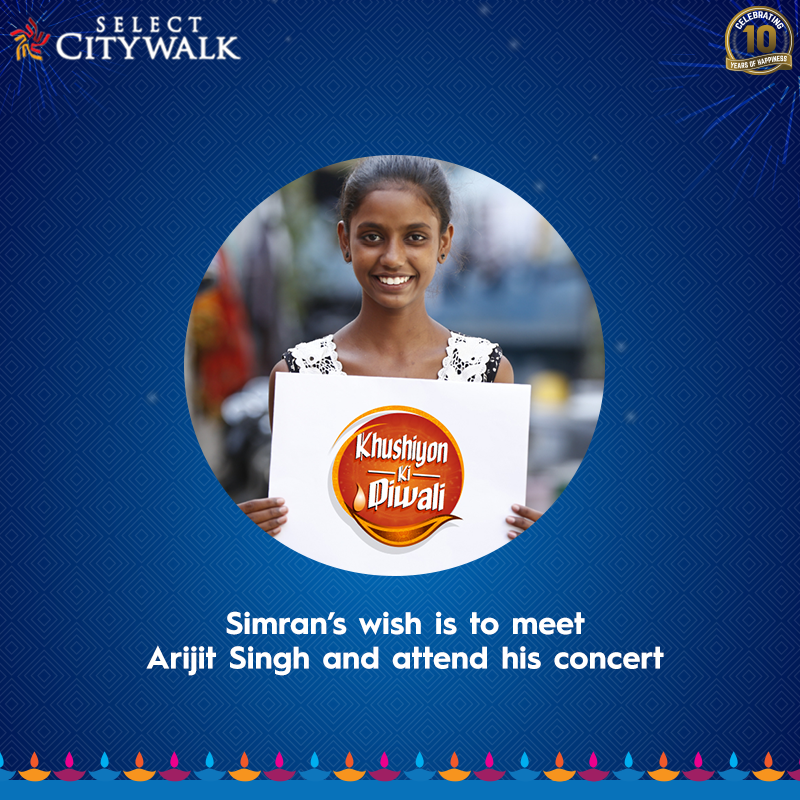 We raised INR 52,583 to fulfill her dream of singing with her favourite artist, Arijit Singh. He always has a cricket ball in his hand and he never misses Dhoni playing for India. To watch his idol, MS Dhoni play live in a stadium, he can go to great lengths but money has always been a constraint. Thus we came together to help raise INR 35,015 for him, to fulfill his small wish. She has never flown on an airplane or been outside Delhi. History and Geography books sowed a seed in Varsha’s mind and then took the form of a dream. We raised a total of INR 30,020 to fulfill her dream of flying to Agra and seeing the Taj Mahal. Kajal thinks a lot about others and wants to find gifts for all her friends. 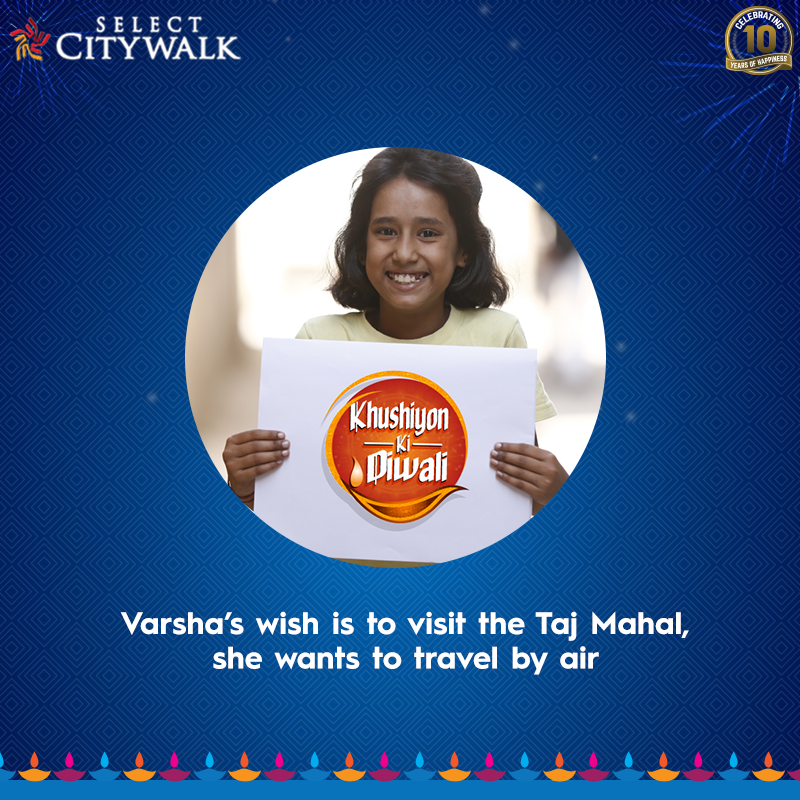 Kajal thinks a lot about others and that is why her Diwali wish is to spend all her time with her friends at a shopping centre, eat a good meal and give everyone a gift. Kajal’s idealism at this young age makes her unique. We raised INR 30,150 for her this Diwali. A boy with vivid dreams who wishes to soar above the world. When asked about his dream, he only says that he wants to “fly”. 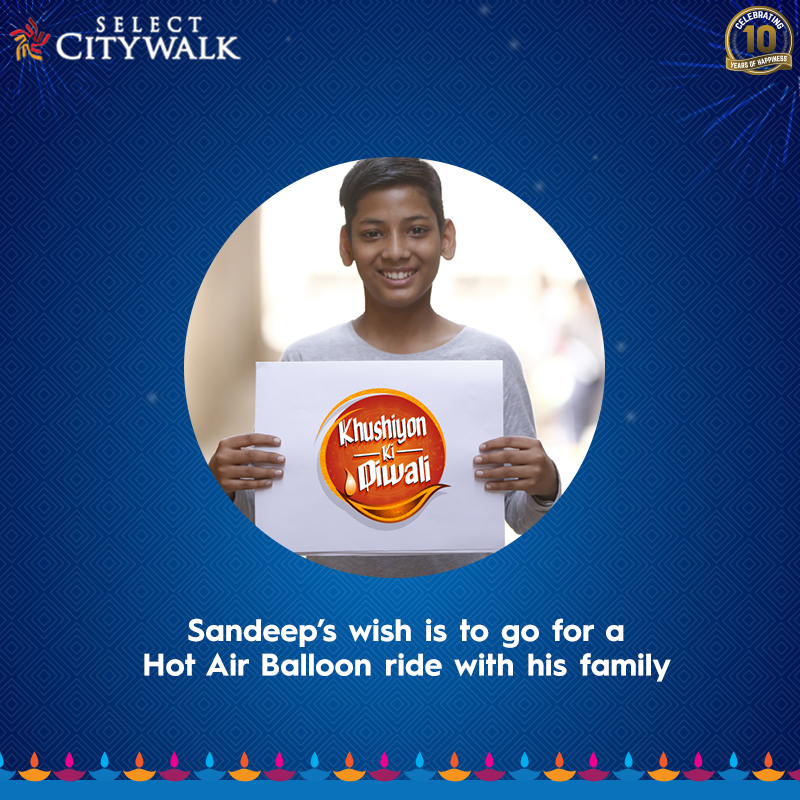 We raised a total of INR 35,051 to make Sandeep’s wish of flying in a hot air balloon come true. Shweta aims to become a flight attendant someday. She dresses up like an air hostess at home in the hope that she will do it every day of her life. When asked about a wish, she said she’d give anything to sit on her first flight and visit an amusement park. To give her the wings to fly, we raised INR 50,031. Spending a day at gaming zone is all he wishes for. Kundan is a bold 13-year-old boy whose parents iron clothes for a living. 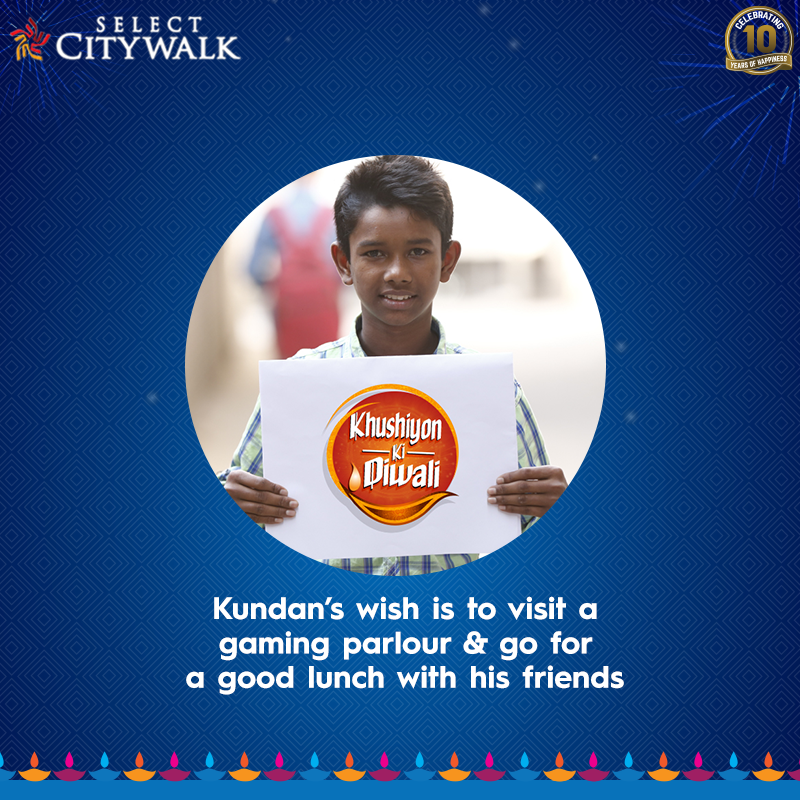 We raised a total of INR 53,070 to take Kundan and his friends to a gaming zone and make sure their bellies are filled with the best food. This campaign goes to show that a small gesture can make a huge difference in the life of someone. We want to thank everyone for successfully completing this Corporate Social Responsibility project, and helping us to light up the lives of these children.